an effective way to keep mosquitoes away at night is to sleep under bed nets. But our aim is to kill these mosquitoes as and when they are lured by the host, said Cedric Pennetier, a researcher whose field of interest lies in insecticide resistance and vector control. 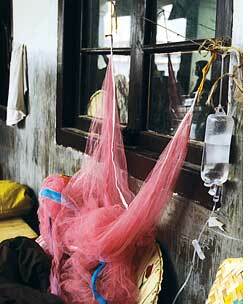 Earlier insecticides called pyrethroids were used to treat mosquito nets. They were fast acting, showed low human toxicity and induced a 95 per cent mosquito mortality rate. But now the gene conferring resistance to pyrethroids has become widespread in African anopheline mosquitoes. The team headed by Pennetier from the Institut de Recherche pour le developpement in France has hit upon a formula to effectively replace the pyrethroidsa mixture of two repellants and an insecticide with low human toxicity.Repellants diethyl-m-toluamide (deet) and kbr 3023 (icardin) and an organophosphate insecticide, pirimiphos-methyl (PM) have been used successfully. The research was carried out in seven villages in Burkina Faso. In each hut adult male volunteers were asked to sleep on mats inside bed nets impregnated with the repellants and the insecticide from 20:00 to 05:00 each day. Windows would be open. After waking up at 5 am, the volunteers collected a live and dead Anopheles mosquitoes from the room, bed net and the veranda. Two trials were carried out for 27 nights each in the dry and the wet season and a 6,932 mosquitoes were collected. A combination of both repellants and the insecticide was as effective as the pyrethroids in killing the susceptible and the resistant mosquitoes. Mortality rates hovered between 90 and 100 per cent and 78 per cent (including live and dead mosquitoes) were found outside the hut. But this strategy faced criticism. Repellants have a short life-span. You cannot depend on them, said Takken Willem, scientist at the Wageningen University in Netherlands. The mosquitoes are also developing resistance to PM. This should studied further, said Pennetier. The November 19 edition of PLoS One published the study.